You have a right to feel — and be — safe when you go out. We can help. Everyone’s heard about being harassed, groped, or followed at bars and clubs — maybe it’s happened to you. Staff at Safe Bars establishments have your back. They’ll check in if they think something problematic is happening. And if you ask them for help, they’ll respond. 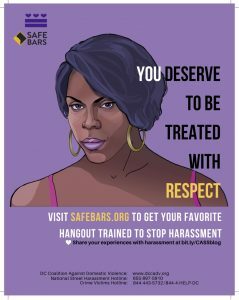 Do you want to bring Safe Bars to your favorite hangout? Shares safety messages that encourage respect and let you know that bar staff are available for help. A bar that’s gone through the Safe Bars training will be a safer, more comfortable, more fun place for you and your friends to hang out. Nearly 1 in 5 women are raped in their lifetimes. About half of those who commit sexual assault are under the influence of alcohol at the time. Unwanted sexual attention, including harassment and groping, is all too common in D.C. area bars and clubs. Sexual aggressors may use these environments to select, isolate, and even incapacitate their targets. But things can be different at Safe Bars. 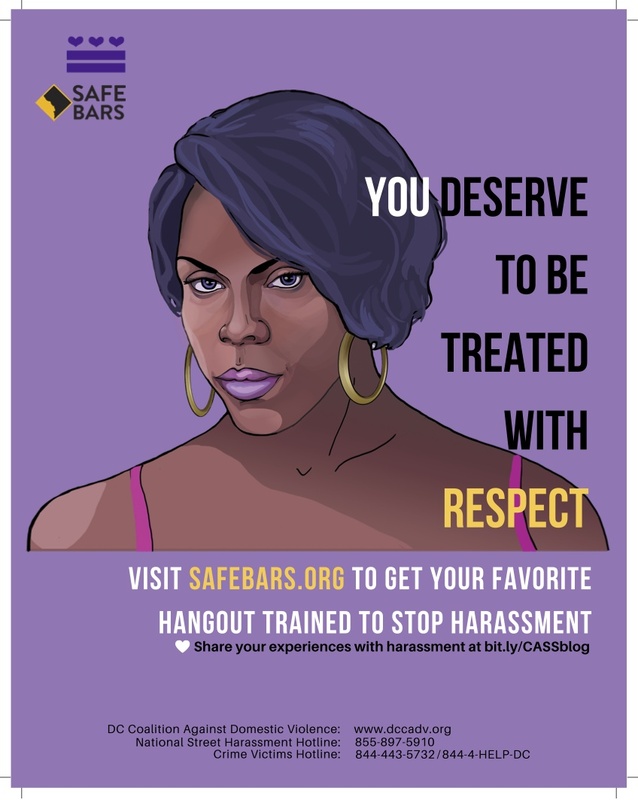 “I was at 801 [a trained Safe Bar] when a somewhat drunk male patron who I was making friendly conversation with went to reach for something at the bar and put his hand on my stomach and pushed me out of the way. The bartender witnessed this and said, ‘Hey, you should not touch a woman like that. You need to leave. 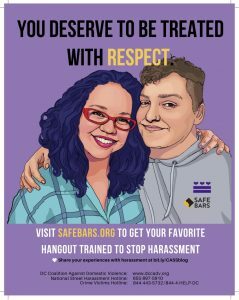 If you want to bring us to your favorite hangout, help us spread the word about Safe Bars, or support Safe Bars in any other way, contact lauren@safebars.org or 301-608-3708.